A fresh rose petal based formulation for a porcelain smooth skin this is also a powerful exfoliating treatment that stimulates the underlying tissues of the skin. By its revitalizing, refreshing & refining actions, this 'Ubtan' helps keep the complexion soft and glowing with a radiant sheen. 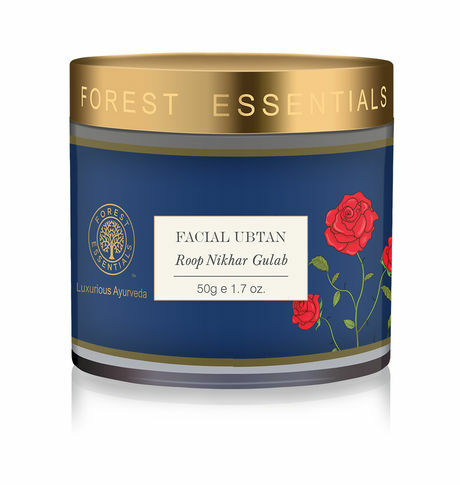 This Roop Nikhar Gulab Ubtan is a powerful exfoliating treatment that stimulates the underlying tissues of the skin. By its revitalizing, refreshing & refining actions, this 'Ubtan' helps in the natural glow of the complexion. It contains a combination of over 26 sun dried & hand pounded, Gulab Petals, herbs, roots and other flowers to make the skin clear and blemish free. Its regular usage prevents the occurrence of premature fine lines and removes tan.